Home > Shop By Brand > BLACKFIRE Pro Detailers Choice Car Care Products > BLACKFIRE Foam Booster 16 oz. BLACKFIRE Foam Booster is a uniquely specialized formula that, when added to any car wash soap will instantly transform it into a foaming car wash! Using a highly concentrated blend of lubricating agents and advanced polymers, BLACKFIRE Foam Booster enhances the cleaning power of your car soap for an overall safer washing experience. Foam is what makes the car wash perform and with BLACKFIRE Foam Booster, you’ll never experience a foam shortage again! One of the biggest things that make a car wash successful is the amount of foam produced. Foam creates a sort of barrier between your car’s surface and any dirt and debris, safely removing them before they can scratch or mar the surface. 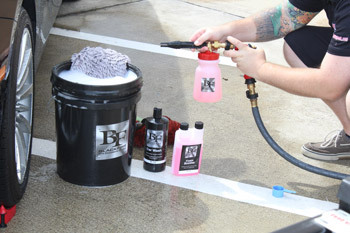 BLACKFIRE Foam Booster is a foaming agent that will enhance any car soap and give it the perfect amount of suds. Contrary to popular belief, not all car soap is created equal. There are wash and wax formulas that leave a layer of protection, ultra-cleaning formulas that strip away any surface protection, and so on and so forth. How many times have you found a shampoo that you love only to find out it doesn’t perform quite as well when used with a foam gun or foam cannon? With BLACKFIRE Foam Booster, that doesn’t have to ever happen again! BLACKFIRE Foam Booster is not a car wash in itself. It is simply a foaming agent that will enhance the car wash that it’s added to! Even if the car wash you already have sitting in your garage isn’t a “foaming” wash, after a quick doctoring with BLACKFIRE Foam Booster, it will be! Directions for use: To transform any standard car wash into a foaming shampoo, simply add Foam Booster to your car wash bottle or to the car wash shampoo already in your foam cannon, foam gun, or wash bucket for an increased amount of suds produced. BLACKFIRE Foam Booster is extremely concentrated – a little goes a long way! BLACKFIRE Quart Foamaster Foam Gun FREE BONUS! Blackfire Power Pack - FREE With BLACKFIRE Orders over $50!BLACKFIRE Car Dryer - FREE SHIPPING + FREE GIFTLimited Edition BLACKFIRE Ultimate Complete Bucket KitBLACKFIRE Detailer's BagBLACKFIRE Car Care KitsWet-Ice Over Fire – A Different Kind of ShineBLACKFIRE Garage Banner, 14 x 55 inchesBLACKFIRE Synthetic Clay Mitt Cleaner - Coming Soon!BLACKFIRE Pro Ceramic Coating Wash 32 oz.BLACKFIRE Complete Coating Maintenance KitBLACKFIRE Compound 8 oz.BLACKFIRE Polish 8 oz.BLACKFIRE Paint Sealant 32 oz.BLACKFIRE BlackICE Hybrid Montan Sealant WaxBLACKFIRE BlackICE Hybrid Montan Sealant Wax 3 oz.BLACKFIRE Car Wash 32 oz.BLACKFIRE Wash & Wax 32 oz.BLACKFIRE Foam Soap 32 oz.BLACKFIRE Midnight Sun Ivory Carnauba Paste Wax 7.4 oz.BLACKFIRE Midnight Sun Ivory Carnauba Paste Wax 3 oz. Just added a capful into a foam cannon mixed with car soap...tons of suds. A little goes a long way. A little expensive so I use it sparingly.